The open-source publishing engine for content authored in the Darwin Information Typing Architecture. DITA Open Toolkit is a publishing tool used to process DITA content and convert it to other formats. Install DITA Open Toolkit for structured authoring, topic-based writing and cross-media publishing workflows. The DITA Open Toolkit docs provide information about running, configuring and extending the toolkit. Open source. Free as a bird. While the DITA standard is owned and developed by OASIS, the DITA Open Toolkit project is governed separately. DITA Open Toolkit is a vendor-independent, open-source implementation of the DITA standard, released under the Apache License, Version 2.0. The toolkit supports all versions of the OASIS DITA specification, including 1.0, 1.1, 1.2, and 1.3. As of Release 3.0, DITA-OT also provides preview support for the MDITA and HDITA authoring formats proposed for Lightweight DITA. The DITA Open Toolkit project welcomes contributions from the community. The project depends heavily on the dedication of a small group of contributors, most of whom work on the project in their spare time. If you use DITA Open Toolkit to publish XML content, we hope you’ll consider contributing to the project in any way you can. Output formats. Out of the box. HTML – HTML5 and XHTML output are supported with a variety of HTML-based navigation types. The HTML output contains class values based on the DITA elements for styling via CSS. PDF – PDF output is generated from XSL Formatting Objects (XSL-FO) via an open-source formatter (Apache FOP) or commercial tools such as Antenna House Formatter or RenderX XEP. 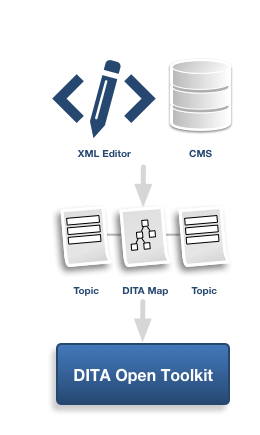 Markdown – Along with Markdown input, DITA-OT now provides new output formats to convert DITA content to the original Markdown syntax, GitHub-Flavored Markdown, and GitBook. Normalized DITA – The DITA-to-DITA transformation resolves map references, keys, content references, and code references for troubleshooting or post-processing with other systems. Eclipse Help – Eclipse output is an HTML-based format that also produces navigation and index files for use with Eclipse information centers. HTML Help – Microsoft Compiled HTML Help output produces a compiled help (.chm) file with HTML topics, table of contents, and index. troff – troff-based man pages are supported; one man page is generated for each input topic. 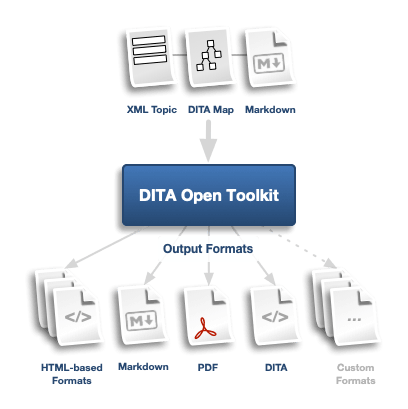 DITA Open Toolkit provides an extensible publishing engine that serves as the foundation of the software ecosystem that enables DITA workflows. For PDF output, DITA-OT generates XSL Formatting Objects from DITA content. The interim XSL-FO format is passed to an FO processor like the open-source Apache™ FOP (included with DITA-OT) or a commercial solution such as Antenna House Formatter or RenderX XEP, which renders the final PDF. To add your company to this list, create an issue or open a pull request.